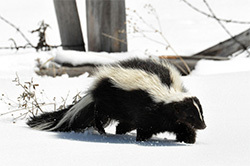 The skunk most commonly found in SE Michigan is the striped skunk. It is about the size of a house cat and can be easily recognized by its black fur and two white stripes on its back. 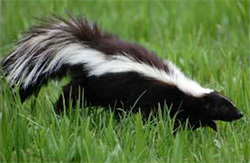 Skunks can be very destructive to lawns and gardens when they dig for grubs and their odor can last for weeks in a home or business. They often knock over garbage cans looking for food and dig large burrows under decks and patios. The average skunk weighs about 8 to 12 pounds and can be as long as 30 inches from head to tail. They have well developed claws that make them very adept at digging. Skunks are nocturnal (active at night) and do not truly hibernate, although they may sleep for long periods during cold weather. They usually live in underground burrows, hollow logs or rock piles. They may decide to live under houses, decks, sheds, cabins or storage buildings. Skunks are omnivores and will feed on a variety of plant and animal foods. They live on grasshoppers, beetles, crickets, and even mice and other small rodents. Human garbage and birdseed from feeders can be other food sources. Skunks breed in February with babies being born in early May. The average litter is about 4 to 6 babies. Babies usually stay with the mother until fall. The best way to control skunks is by trapping and relocating them. Once the animal has been removed the den should be filled in and exclusion and repairs should be made to prevent future problems. Decks and sheds can be screened or “rat walled” by digging a trench around the structure about 1 foot wide and 1 foot deep. Bend the screen in an L pattern and fasten to the deck or building using staples or screws. Once the screen has been fastened, fill in the trench. Properly dispose of garbage or debris that will attract skunks.